AT A TIME WHEN EVERY SECOND ‘UNOFFICIAL’ CHINESE FEATURE FILM FEELS LIKE A SUB-JIA ZHANGKE TALE OF MISERY FROM THE PERIPHERY OF THE NATION’S ECONOMIC MIRACLE, IT’S REFRESHING TO SEE THE MAN HIMSELF EXPLORING NEW TERRITORY. JIA’S MOST RECENT FEATURE, THE DOCUMENTARY-DRAMA HYBRID 24 CITY, CONSIDERS CHINA’S DRAMATIC ECONOMIC TRANSFORMATION THROUGH THE STORY OF FACTORY 420—ONCE A STATE-OWNED INDUSTRIAL SHOWPIECE NOW BEING KNOCKED DOWN TO MAKE WAY FOR LUXURY APARTMENTS. THE 19-MINUTE SHORT DRAMA CRY ME A RIVER IS A MORE CONVENTIONAL PORTRAYAL OF THE DISILLUSIONMENT AND ENNUI OF MIDDLE AGE, BUT WITH A PARTICULARLY CHINESE HISTORICAL INFLECTION. 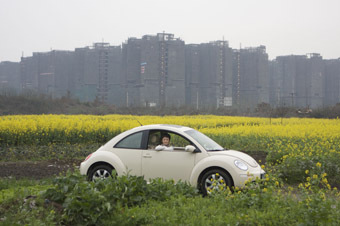 24 City focuses on Factory 420, formerly a vast military industrial plant that producead parts for Chinese warplanes. Originally situated in Shenyang, northeast China, the factory and many of its personnel were relocated to Chengdu, deep in the country’s interior during the Korean War. As one of the managers recalls, in its heyday 420 was a self-contained city, employing thousands and tending to all their material needs, including meals, housing, schools and cinemas. With China’s move to a market economy, Factory 420 has fallen on hard times and the workforce has steadily shrunk since the mid-1990s. What’s left of the former behemoth is now being moved to Chengdu’s outskirts to make way for a luxury high-rise apartment complex called 24 City. Jia’s film opens with images of overall-clad workers shuffling in and out of buildings en masse, and a manager addressing the workforce in a dingy meeting hall about looming changes in the factory. The overall impression is one of drab conformity. From this broad beginning we hone in on the first of the film’s interviewees, He Xikun, who first came to Factory 420 in the early 1960s. Recalling the frugal, self-sufficient ethos of that era, He explains how workers were expected to forge their own tools when they arrived at the factory. Darker memories also surface when He discusses how his dedicated supervisor continued coming to work at a time when most employees stayed away—presumably a reference to the chaotic early years of the Cultural Revolution. Details of the period elude us though, as He Xikun becomes visibly distressed and lapses into silence. A long series of interviews with former factory personnel follows He’s foreshortened tale, including an ex-party secretary and a woman laid off in the mid-1990s. It gradually becomes clear, however, that 24 City is not a straightforward talking-heads documentary, since at least some of the interviewees are in fact actors. For different audiences this realisation hits at different points; many non-Chinese viewers don’t register the presence of professional performers until Joan Chen appears towards the end of the film. In fact the first actor to appear is Lu Liping—famous in China, but not widely known outside the country. With his undifferentiated mixing of workers and actors, Jia deliberately challenges the assumptions and investments we tend to bring to documentaries, an interrogative approach most clearly illustrated in his ‘interview’ with Gu Minhua, the worker played by Joan Chen. She recounts her arrival at Factory 420 at the end of the 1970s, where she quickly gained the moniker “Xiao Hua” (Little Flower), due to her resemblance to the main character of a famous eponymous Chinese film of that time—the punchline being that it was this role that made the teenage Chen a star in mainland China. Zhang Zheng’s Xiao Hua (1980) told the story of a young woman’s love for a revolutionary soldier during China’s protracted civil war. The film was typical of the immediate post-Mao era in that it personalised China’s revolutionary history through a love story, in contrast to the collectivist ideals pushed during the Cultural Revolution. It’s a good example of the way China’s mass media—including the nation’s cinema—has long been subject to the Communist Party’s ever-changing ideological line. By using Chen as one of his ‘workers’, and having her reference her early propagandistic features, Jia asks his audience to reconsider and question the historical narratives they have been fed over the years, particularly on the silver screen. In the end, of course, this reflexive approach leads to a circle of maddening questions. What, if anything, is real in 24 City? More broadly, in a nation where official historical narratives are constantly rewritten to suit the ideological needs of the present, what constitutes the ‘real’ in the history of the People’s Republic? And how do people make sense of their personal histories, let alone the experiences of the nation as a whole, in a country where critical interrogations of the past 60 years are simply not permitted? In this context, the pained silence of the worker He Xikun is perhaps more ‘real’ than the detailed, semi-fictionalised accounts we hear from the actors—but where does this silence leave us in terms of understanding? The heavily prescribed freedoms of China’s new economic order offer no resolution to these questions for Jia, as the film’s final interview makes clear. Su Na—played by Jia’s personal and artistic partner Zhao Tao—is a “professional shopper” who journeys regularly to Hong Kong to procure goods on commission for rich Chengdu residents. Dressed in fashionable clothes and sporting a chic hairstyle, Su has clearly transcended the dull factory grind endured by her parents. Yet with her uncritical embrace of a materialistic lifestyle it feels as if she has simply swapped the manufactured identity of a model socialist worker for the prepackaged image of the fashionable globe-trotting consumer. The one moment that seems to transcend the historical conundrums at the heart of 24 City comes when Jia’s camera unexpectedly captures a pretty young girl elegantly roller-blading around a small rooftop on the edge of the factory complex. She pauses as the figure behind the camera asks if her parents work at 420. She nods, and the offscreen voice asks if she has ever been inside the factory. She shakes her head before gliding out of shot to resume her graceful turns. Is this where truth lies for Jia—in quiet moments of subjective personal expression that transcend words, ideology and history? Or is the sequence’s fleeting sense of freedom simply another illusion? Cry Me a River is a less ambitious film, but an intriguing detour for Jia into quiet domestic melodrama. Four ex-classmates—formerly two couples—reunite in a watery southern town. Over a small banquet, their one-time teacher recalls a poetry journal they founded in their university days titled This Generation, one of the countless literary periodicals that played a crucial role in the liberalisation of Chinese universities in the 1980s. The next day the former classmates pair off, wandering the town and skirting around their shared past in awkward conversations loaded with hidden meanings. Jia demonstrates his masterful grasp of mise-en-scene by conveying much of the work’s subtext through framing and setting. One couple wander listlessly beside a still lake, lost in thought, hinting vaguely at the passionless state of their marriages and working lives. The other pair move through the town’s canals on a small boat, rocking as they verbally spar, stoking the embers of a passion still gently smouldering, but unlikely to reignite. Cry Me a River harkens back to Fei Mu’s similarly restrained 1948 classic Spring in a Small Town, set in the aftermath of the Japanese War. Both films centre on characters trapped in the slipstream of larger events which are only elliptically alluded to. Jia’s work is not simply homage however. Cry Me a River updates Fei Mu’s drama by deftly evoking the lost hopes of China’s 80s generation, whose idealism has dissipated under the combined weight of political repression and apathy fuelled by the nation’s increasing material wealth. In very different ways, Cry Me a River and 24 City show Jia Zhangke turning an ever more nuanced critical eye on his homeland. While earlier works like Xiao Wu (aka Pickpocket, 1997) and The World (Shìjiè, 2004) portrayed the losers in China’s new economic order, these recent films subtly probe the dreams, ideals and ideologies that have shaped China’s people over the past 60 years. It’s this complex, critical approach that makes Jia’s work so compelling and so essential in a country yet to come to terms with its past, in a world yet to come to terms with a rising China. 24 City (Er shí sì chéng jì), director, writer Jia Zhangke, writer Zhai Yongming, producers Jia Zhangke, Shozo Ichiyama, Wang Hong; performers Joan Chen, Lu Liping, Zhao Tao, Chen Jianbin; People’s Republic of China, 2008; Cry Me a River (Héshàng de àiqíng), writer, director Jia Zhangke, performers Zhao Tao, Wang Hongwei, Hao Lei, Guo Xiaodong, People’s Republic of China, 2008.